Whether you are an expert in the field of educational enrichment or not, I believe that we can mostly all agree upon the fact that it is important and almost certainly something all students can benefit from. That being said, let’s take a look at 10 great reading enrichment activities for elementary-aged students! Check out your local area for an after-school enrichment program that will allow your student to stay focused and challenged in English all year through. It almost goes without saying that summer is a great time to check out enrichment camps that will help expand your child’s reading and writing knowledge, but some areas may even offer year-round camps and after-school programs. Check them out! Most libraries and even some popular restaurants and stores offer free summer reading programs for students. Allow your child to see a more tangible result of his/her hard work by receiving rewards through these programs. Seriously! In researching for this post, I came across a great post from “Miss Giraffe’s Class” about how to keep more advanced students engaged and learning, and I loved her strategy for letting students teach the class. Now, you may not be able to control how your child’s teacher runs the classroom, but you don’t need to! No matter what level your children are, they can benefit from teaching others what they have learned. This allows them to expand their knowledge by thinking about topics in a different way, and also by forcing them to think about how to explain them to others. So pull up a chair every so often after your child gets home from school, and let him or her teach you a thing or two! Pinterest is a great resource for searching for projects that take English and reading class to the next level. Search “Enrichment Activities” for projects and hands-on learning activities that combine reading and writing with skills used in other school subjects. Need somewhere to start? Why not create a new animal as shown in a post from “I Love 2 Teach”? Though many students don’t prefer it, writing is a great way to boost creative thought and communication skills. Luckily, in this day and age, there are all sorts of ways students can be inspired to write in a way that feels less like work and more like play. One example is this free download for a “Roll-A-Story” sheet, which helps your child come up with ideas for his or her own original story. Many times, you may find that your child has finished his or her work very quickly, or that topics are very easy for them to understand, leaving them bored. Be prepared for these times by having some activities on hand that your child can complete when this happens. Once again, Google and Pinterest are great resources to find free sheets that deal with any number of topics for “fast finishers” or “gifted” students. Pro tip: make sure the activities you choose deal with the topic your child is focused on. The goal should be to expand upon the topic and to explore it on a deeper level, not to force busy work. What do you think? 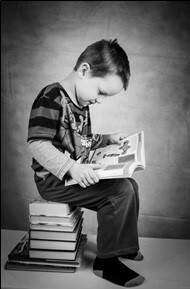 What are the best ways to provide reading enrichment for children? How do you provide enrichment for your children at home? We would love to hear from you in the comments!